There’s a new online threat to writing. Critics of the web like to blame email, texts, and chat for killing prose. Even blogs—present company included—don’t escape their wrath. But in fact the opposite is true: thanks to computers, writing is thriving. More people are writing more than ever, and this new wave of everyone’s-an-author bodes well for the future of writing, even if not all that makes its way online is interesting or high in quality. But two new digital developments, ebook spam and content farms, now threaten the survival of writing as we know it. According to the Guardian, growing numbers of “authors” are churning out meaningless ebooks by harvesting sections of text from the web, licensing it for a small fee from online rights aggregators, or copying it for free from an open source like Project Gutenberg. These authors—we could call them text engineers—contribute nothing to the writing process beyond selecting passages to copy and stringing them together, or if that seems too much like work, just cutting out the original author’s name and pasting in their own. The spam ebooks that result are composed entirely of prose designed, not to convey information or send a message, but to churn profits. The other new source of empty text is content farms, internet sweatshops where part-timers generate prose whose sole purpose is to use keywords that attract the attention of search engines. The goal of content farms is not to get relevant text in front of you, but to get you to view the paid advertising in which the otherwise meaningless words are nested. Ebook spam and content farms may sound like the antitheses of traditional writing, in that they don’t inform, stimulate thought, or comment on the human condition. They’re certainly not the kind of repurposed writing that Wired Magazine’s Kevin Kelly foresaw back in 2006 when he wrote that we’d soon be doing with online prose what we were already doing with music: sampling, copying, remixing, and mashing up other people’s words to create our own personal textual playlists. Kelly, who was paid for his essay, also predicted that in the brave new world of digital text the value we once assigned to words would shift to links, tags, and annotations, and that authors, no longer paid for producing content, would once again become amateurs motivated by the burning need to share, as they now do with such abandon on Facebook and Twitter. But if we mash up Kelly’s futuristic vision with the harsh reality that strings of keywords may bring in more dollars than connected prose, then it’s possible that tomorrow’s writers won’t be bloggers, Tweeters, or even taggers, they’ll be scrapbookers, motivated by the burning need to cut and paste. The web may be making authors of us all, but the growing number of content-free links threatens to put writing as we know it out of business. A cynic might argue that far too many writers have already mastered the art of saying absolutely nothing, so we shouldn’t be surprised if our feverish quest to capitalize on the internet, combined with the vast expansion of the author pool that the net makes possible, have created the monster of contentless prose. We get the writing we deserve. Forget about the five-paragraph theme, the inverted pyramid, and write-revise-publish. 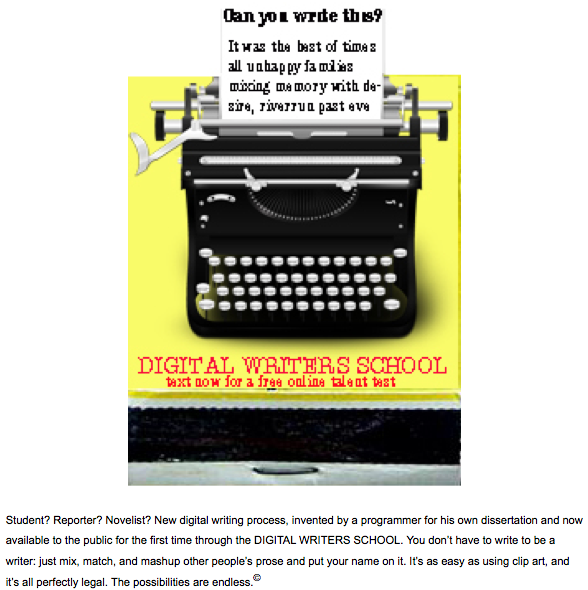 The Digital Writers School has a foolproof formula for the digital age: cut, paste, upload. It may not get you a Pulitzer or the Mann Booker, but if you give up the search for the right word and learn instead to game the search algorithm, you could find your writing bringing in a lot of cash per click. No experience necessary! Text today for a free online talent test. It may seem paradoxical to make money by selling something that is meaningless, but it turns out that today’s most-successful marketing is based on this very paradox. So content-free prose will either be the death of writing, or the next big thing. Dennis Baron is Professor of English and Linguistics at the University of Illinois. 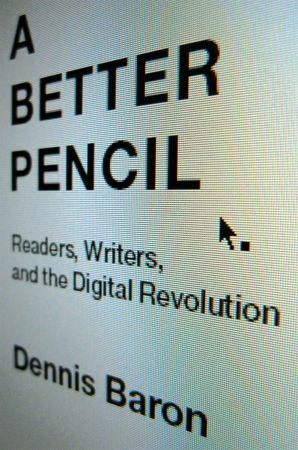 His book, A Better Pencil: Readers, Writers, and the Digital Revolution, looks at the evolution of communication technology, from pencils to pixels. You can view his previous OUPblog posts here or read more on his personal site, The Web of Language, where this article originally appeared. Until next time, keep up with Professor Baron on Twitter: @DrGrammar.